Hatton Garden is an area of London that thrives on its reputation for being the best. The best at making and selling fine jewellery and diamonds. The place has other things to offer. of course Hatton Garden is in the heart of London and therefore you will often see bankers and professionals getting to and from work. But Hatton Garden has something very special about it and that is that its the home of expert jewellers and diamond dealers who are making and designing the best accessories out there. Highly regarded as more prestigious than going to places like Tiffany & Co and certainly equal in price to high street shops you find in your local shopping center, it seems to be the only place to turn for quality. Even more importantly, where do you think these stores in the retail arena are getting their good from? Hatton Garden of course! So why exactly is Hatton Garden a must when buying jewellery? well its quite simple. The experts are there bringing you quality good straight from the source. In this area of london, you can find goldsmiths, jewellry setters and diamond sorters who are all working together to make the perfect item for you. You can actually walk into a store, preferably Finecraft Jewellers on Greville street, and design the ring, or necklace that you’ve always wanted. If you are looking to make a secret purchase for that special person in your life, the jewellers (being local businesses) will sit and go through all the possibilities before you make that purchase. The best part is that the prices are tailor made for you, so your wallet or purse will not go through too much abuse, especially compared to shopping at retail stores with high overheads. 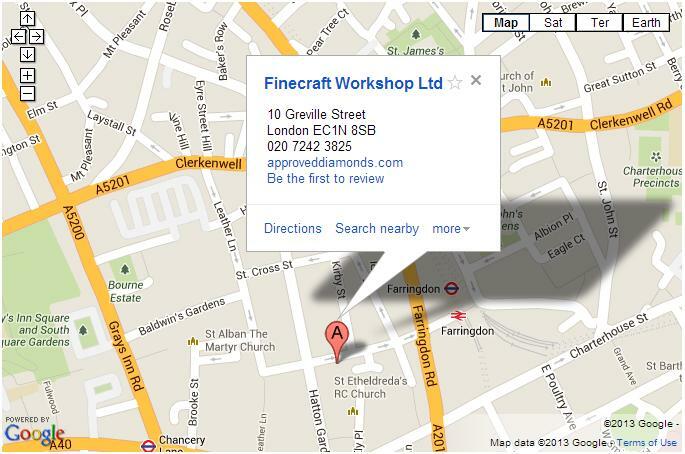 Hatton Garden has a wealth of places for you to choose from, and some of our past posts recommend the best choices. Make a clear decision of what you want, and go from there! Heading to Hatton Garden will be the perfect choice for you.